I use waterproof mascara because it actually stays on and doesn't run, but it's difficult to get off! For years I bought Covergirl Eye Makeup Remover ($3.95 at Walmart, $4.79 at Walgreens) but this year . . . I'm making some changes! Why use ingredients that are dangerous? (MINERAL OIL/ HUILE MINÉRALE, ISOPROPYL PALMITATE, POLYETHYLENE, CETETH-20, TRIHYDROXYSTEARIN, SORBIC ACID, METHYLPARABEN, BUTYLPARABEN, PROPYLPARABEN, VANILLIN, TITANIUM DIOXIDE). Paraben is used as a preservative, but has been found in breast cancer tumors and studies have shown it affects reproductive systems. Need I say more? 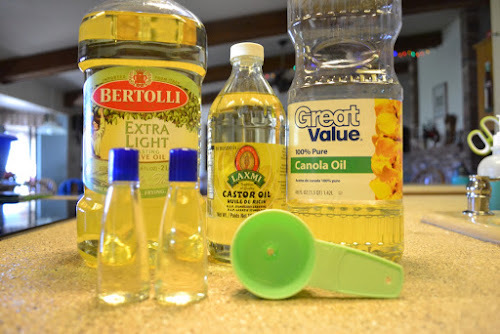 This little recipe contains 3 oils ~ Canola, Caster, and Light Olive Oil. Most of you probably have canola oil and light olive oil in your kitchen already! Castor oil can be purchased at the pharmacy. I purchase my castor oil in a larger quantity for use in my homemade shampoos, shaving soaps, and my new recipe for makeup remover at a store called Lee Lee Oriental Market. The castor oil is found in the India section of the store. No Lee Lee . . . you can purchase castor oil (here). I washed out those little shampoo bottles Will brings home when he stays at hotels on business trips. They work perfectly because the bottle has a small opening to control the amount of oil that comes out. GENTLE EYE MAKEUP REMOVER ~ works great for lipstick removal also. Mix the 3 oils together and pour into a clean container using a small funnel. Pour a small amount of oil onto a clean cotton pad and gently wipe over lashes and eyelids. Gentle Eye Makeup Remover uses all natural ingredients and makes quick work of removing even waterproof mascara! Remember, there are no preservatives in this so it won't last indefinitely, that's why mixing up a small batch is best. It is so exciting to be making my own beauty products, and a great feeling knowing there's an easy, inexpensive, natural way to make a superior product . . . Over at Julie's!! !